Cult Comedy/Horror. Directed by Sue Corcoran. Screenplay by Angie Louise. Songs by Angie Louise, arranged by Bruce Monroe. Four actors audition for the role of Jesus: a black revolutionary (Jeff Gilbert), a bisexual stoner (Tim Gouran), a Jew (Todd Licea) and a woman (Angie Louise). 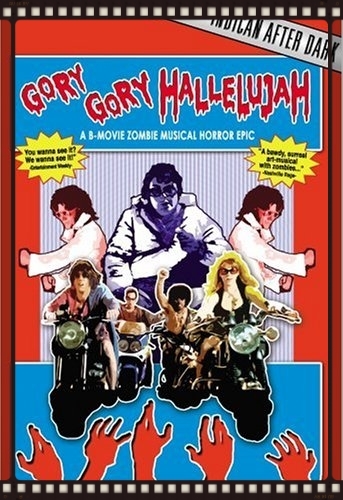 When all four are rejected, they hit the road for New York City, but a run-in with a gang of Elvises ends in murder and strands the foursome in the redneck town of Jackville, where folks don't take kindly to blasphemers. This can only lead to the apocalypse, seasoned with the rising of the dead and an MGM musical ending. "Wildly entertaining and wickedly subversive." - Richard Elfman, director of "Forbidden Zone"
"Brilliant! The Von Piglet Sisters are courageous, talented, and totally original." - Lloyd Kaufman, director of "The Toxic Avenger"
Fantasy Short. Directed by Sue Corcoran. Screenplay by Angie Louise & Sue Corcoran. Featured song: "Fly, Violet, Fly" by Angie Louise. Circus dwarf Baby Violet (Wendy Ashford) gets shot out of a cannon in a metaphor for life in this surreal short made for Seattle International Film Festival's Fly Films. Co-stars Angie Louise and Tim Gouran as Violet's circus-performer parents Eve and Adam, and Richard Sanders ("WKRP in Cincinnati") as God. This second award-winning collaboration between writer-actress Angie and director-producer Sue Corcoran won Best in Show at the Accolade Awards and Best Short at the Nell Shipman Women In Film Awards, was honored at the Seattle Science Fiction Film Festival, and appeared in Seattle Women In Film's compilation DVD of international shorts by female filmmakers. Family comedy starring Elliott Gould. Directed by Sue Corcoran. Screenplay by Angie Louise, Douglas Horn, Sue Corcoran. Featured song: "Christmas Is For Everyone", written by Angie and performed by a gang of spunky kids in the film's epic pageant finale. Ira Finkelstein (Elijah Nelson) craves the Christmas of his dreams, and he's not about to let a little thing like being Jewish get in his way. But when Ira trades places at the airport with another kid, his undercover vacation brings more than he bargained for, teaching two families the true meaning of Christmas. Angie appears as a B-movie diva trying to portray a space-age Mrs. Claus on a disastrous movie set. Originally titled "Ira Finkelstein's Christmas", SWITCHMAS was awarded "Best of the Fest" at Seattle International Film Festival and Best Comedy at the Newport Beach Film Festival in Los Angeles.